Did you know that Palmolive came out with a new dish soap? Big deal, right? When new products are released though, there are always coupons released about the same time. When these new products hit the stores many times the store will put it on sale to generate sales since there isn't much item loyalty at this time. Sale+coupon=cheap=Right up my alley! This is how I ended up with a few bottles of this new 'Soft on Hands' with Vitamin E dish liquid. As I'm unpacking my grocery bags I start thinking that this would probably make a great hand scrub! As much as I'm working in the dirt and cleaning away a winters worth of dirt in the coops and barn I really need to mix up some new hand scrub! 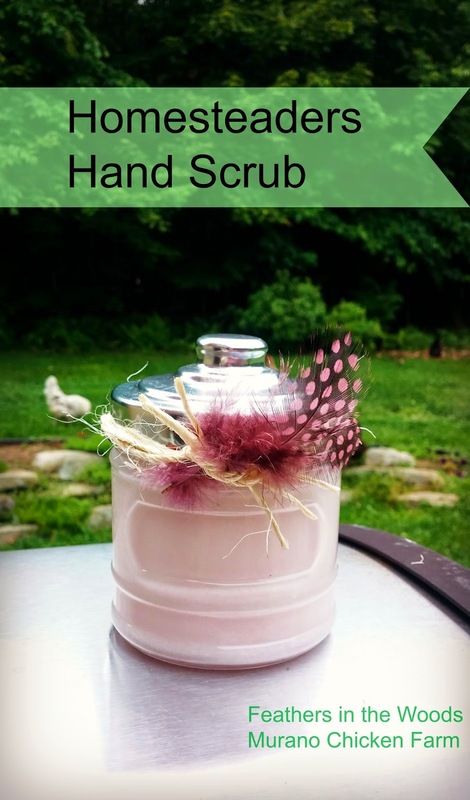 Hand scrubs are one of the easiest body care products to make at home. This is the easiest recipe of them all. It uses nothing but sugar and soap, plus a cute little jar! First I filled my jar about 3/4 of the way with plain sugar. 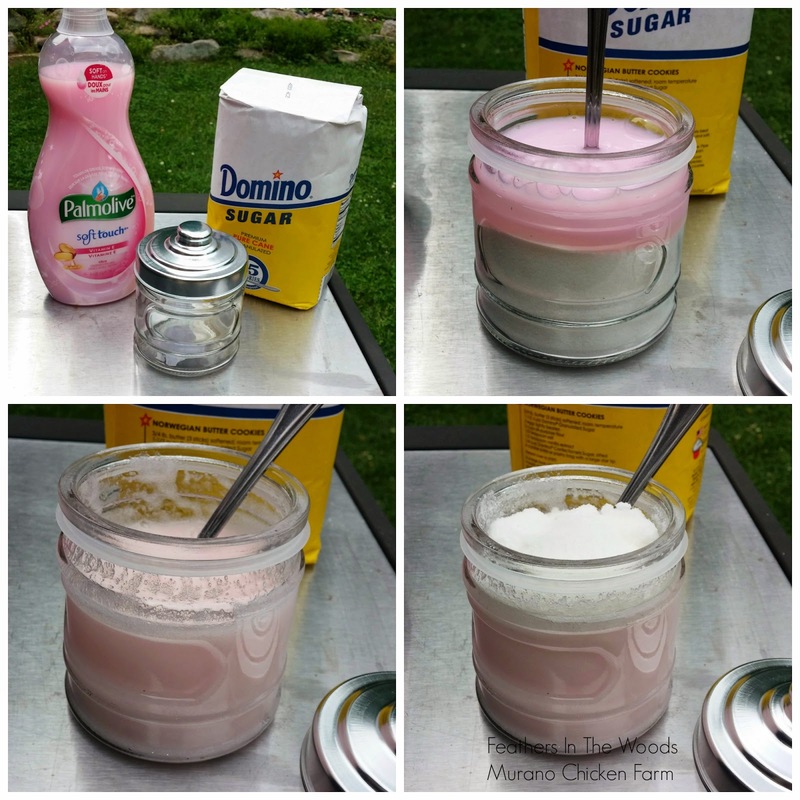 I use Domino's because it's pure cane sugar, and unless it says cane sugar it's probably GMO beet sugar) Next I added the Palmolive dish soap. Then I mixed it up. It was sort of runny, but when you mix the 2 ingredients it settles a bit. I added more sugar and mixed again. It was now about the right consistency. You want it thick enough that you can scoop it out, not so runny that it pours. That's it, you're done! I liked the light scent but you can add a few drops of essential oil if you prefer something different. You could also use a different scented dish soap if you want to make a more manly scrub. Dawn's original blue would be nice for men. I put it in a dollar store jar and tied a bit of twine around the lid. I like these jars because they come in all different sizes. I made this smaller one for my downstairs bathroom. I also added a few dyed Guinea feathers for decoration, but dried flowers would be pretty too. You'll notice that I didn't give exact amounts for the recipe. It's about a 4:1 ratio. You might like it thinner or thicker then I do, but more then that if I tell you 4 cups sugar to 1 cup soap....you'll going to have a LOT of scrub to jar up! If you're making gifts, that would be great, but for home use I prefer to just mix it up 1 jar at a time. I've been dabbling in homemade beauty products for probably a dozen years now. Don't get me wrong, I loves me some Lush...but I'm cheap remember? So while I love the smell of loveliness that high end beauty products have, I know I can make it much cheaper (and healthier) myself. When you make your own body scrubs, lotions, lip balms, creams etc you can also control just how much chemical your body comes in contact with too. Did you know that your skin is your body's largest organ? It absorbs the stuff we put on it and I'm just not comfortable putting tons of chemicals on my skin on a regular basis. I make several different types of scrubs, admittedly this one has the highest chemical content of them all (since it uses pre-made soap) I also only use this for the times when my hands are the dirtiest....like after gardening all day. You'd be surprised how well this will scrub the ground in dirt right off your hands. Give it try, I think you'll love it! I'm looking forward to looking around. Awesome. I need to do a sugar scrub. My hands get so dry and scaly, This looks easy and do-able!! This sounds wonderful and I love your presentations! Thanks for sharing with SYC. How fun! This would make a great gift with some gloves, etc. Thanks for sharing at Simple Lives Thursday; hope to see you again this week!